Kids that may struggle in a traditional classroom environment often thrive at the bike shop. 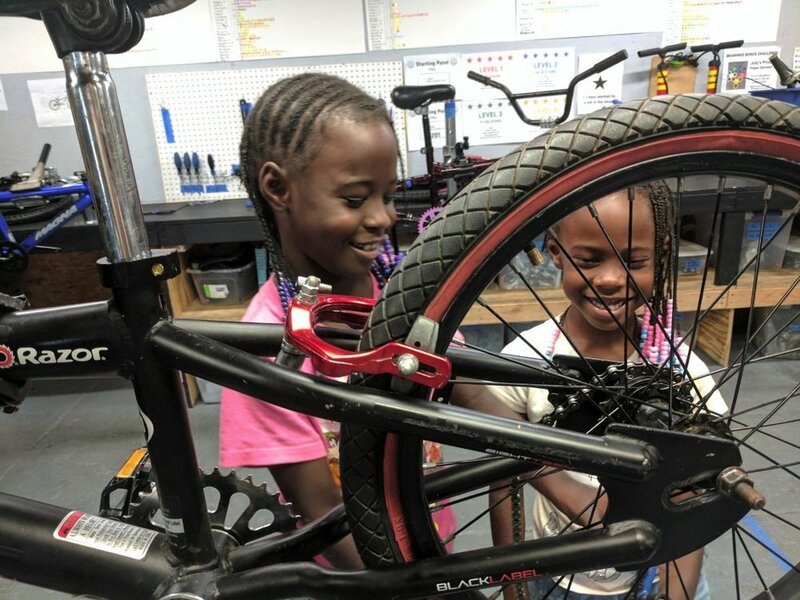 A sense of accomplishment, pride, and valuable skills develop in a new way when kids learn the mechanics of a bike and have a space to explore their interests and be curious. Sometimes that comes in unexpected places. Read more. We all have memories of riding a bike as a kid. For some, it’s the memory of first riding with no hands. Or learning to pop a wheel-y. Or maybe going on family bike rides. The joy you experience riding a bike as a kid is like no other. We see that joy every day at Bearings Bike Shop. But we hope kids experience even more through our program. Read more. Tiana and Te’ora live just down the road from the bike shop. When they enrolled in the program in April, the girls quickly started learning the various components of a bicycle and earning a star for each hour they worked. Just three or four weeks into their time at the shop, both girls earned enough stars to purchase their very own bikes! They rode home on pink wheels and pink handlebars, and were over-the-moon excited. Read more. When Co-Founder Tim and Intern Nick met each other in 2009, it was not in any sort of typical manner. Watch Tim and Nick reflect on the friendship that grew from that first unusual encounter and Nick's personal growth as a result of being involved in the bike shop and connected to the O'Maras. Watch now. While most of their peers were headed to the pool or the mall this summer, nine Bearings’ teens chose a different summer experience. By participating in Bearings’ Advanced Job Training program, they spent eight weeks developing the skills and habits essential to future employment success. Watch now and Read more. Warren and Rashid have both been interns in our Advanced Job Training Program over the summer. Still in high school, they both work part-time in the shop after school as Program Associates. Warren holds the record of being the first participant to go through all four levels of our mechanical training and will be one of the leaders in our program next summer. Read Warren’s story. Rashid stands out due to his strong work ethic and natural aptitude for learning. Read Rashid’s story. Allana has been coming to Bearings Bike Shop for years. She is our first female participant to test through all levels of mechanical curriculum. The Skills for Life (perseverance, communication, self-control, responsibility, and critical thinking) that Bearings is instilling and evaluating students on during the program, were not lost on Allanna. Read her story here. 20-year-old Travonus was featured last month in 11Alive’s video on the Bearings Bike Shop and how it started, and there’s a reason why. She is a role model for kids in the neighborhood she grew up in, and someone we love to brag about as often as we can. In addition to her kind demeanor, what has always stood out about Travonus is her work ethic. Read more. Tim and Becky O'Mara founded the Bearings Bike Shop in 2008, on accident. 11Alive recently shared their story with the city of Atlanta. Watch the video. Her sons began coming to the bike shop in 2016. Little did Lekita Chambers know they weren't the only ones whose lives would be impacted! Read more.